By ShowChrome Accessories. 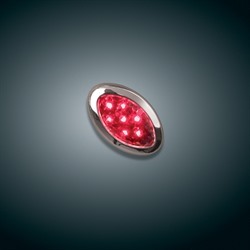 These Red Mini LED Accent Lights can be mounted in any desired location for added safety or just anadded accent color. Mini LED Accent Lights contain 7 mini LEDs. The lights feature bright chrome housing with a domed clear lens and mount with double sided tape provided. Accent Lights measure 1.5" Long x 1" Wide x .4" High and run on 12 Volts.Switch is not provided.